Local engineering firm, Timmons Group, announced the completed construction for the Surgery Center at Sentara Northern Virginia Medical Center located in Woodbridge, VA. The project includes a brand new operating room addition and consolidation of the hospital’s surgical services into a single site. The new 2 story building houses the Central Sterile department, Sterile prep area and additional support space. Located on the first floor, there is a pre and post operation area containing 28 beds, a PACU space with 16 beds and 10 operating rooms. The new center will allow patients to receive complex surgeries in a comfortable outpatient environment with high quality care focused on safety and patient satisfaction. “It has been a pleasure working with Sentara Hospital, Odell Architects, and local departments to complete this high profile project. Healthcare is a booming industry and we are proud to have been part of a hospital that is blending technology and healthcare so seamlessly,” said Bill Vest, Senior Project Manager of Timmons Group. 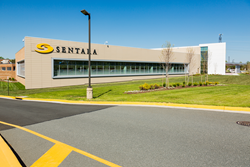 Timmons Group worked closely with Sentara Hospital to develop a site plan for the 67,000 SF addition. The civil planning accounted for the extension and relocation of all public and private utilities, relocation of an existing helipad to allow for full vehicular access to the existing emergency room during construction. Timmons Group is a multi-disciplined engineering and technology firm recognized for over 25 years as one of Engineering News Record’s (ENR) Top 500 Design Firms in the country. The firm provides economic development, civil engineering, environmental, Application Development, GIS/geospatial technology, landscape architecture and surveying services to a diverse client base. Headquartered in Richmond, Virginia, Timmons Group has regional offices across the United States. For more information, visit http://www.timmons.com.